As the U.S. Government continues to waste time debating over the “Debt Ceiling Delusion”, the death of the fiat monetary system grows closer. 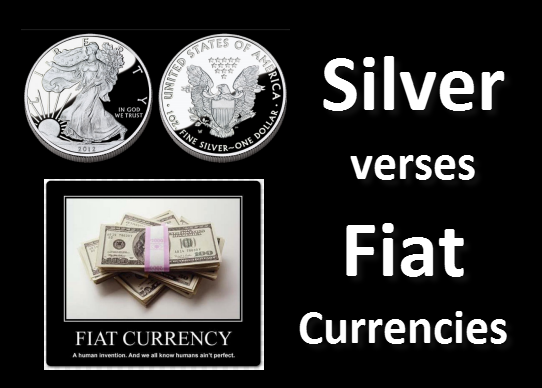 Since 2000, the value of gold and silver have increased substantially compared to the world’s fiat currencies. 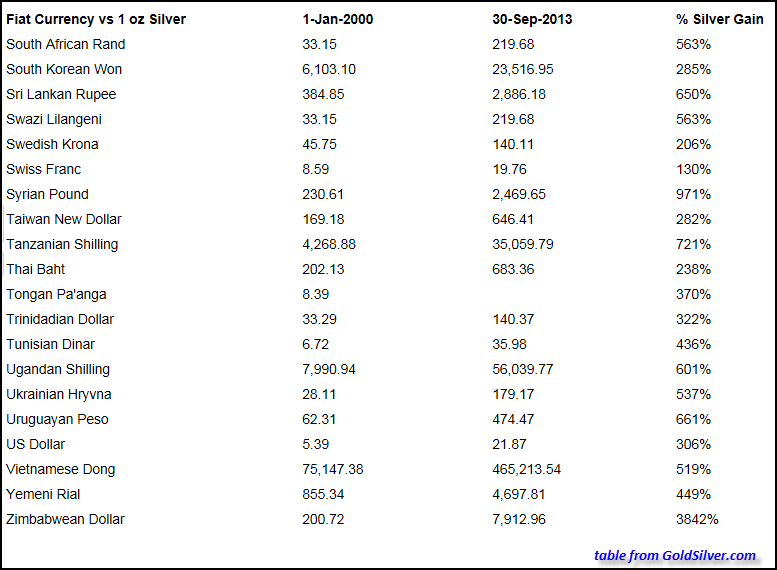 According to GoldSilver.com article, Race to Debase 2000 – 2013 Q3 Fiat Currencies vs. Gold & Silver, fiat currency has lost on average of 78.16% of its value compared to silver. 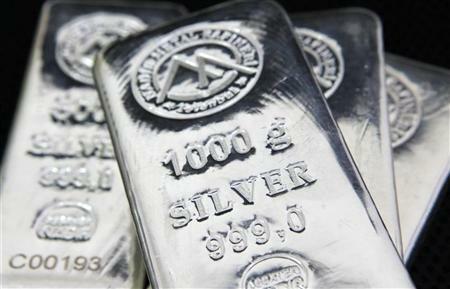 If you had purchased silver in South Africa in 2000, it would be worth 563% more today. We can see also why the Vietnamese have been buying the precious metals as silver is worth 519% more today than it was in 2000. The world is now in the last stages of the Fiat Monetary System. 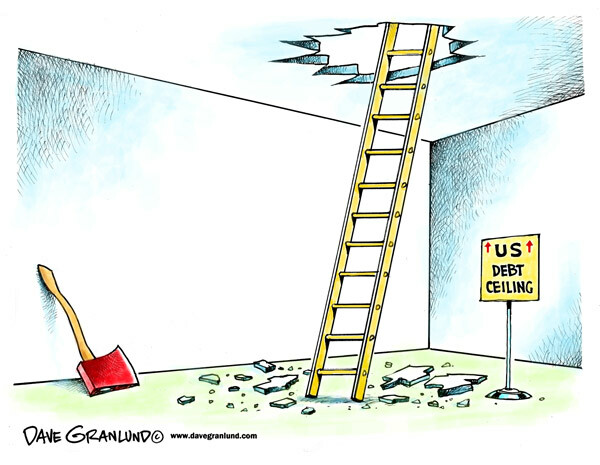 The debate on the U.S. Debt Ceiling is masquerading the fact that there is no solution or remedy except a grand collapse of the financial system. This is also a preview of Episode 4 of the series, Hidden Secrets of Money which I highly recommend watching the full version when it is released shortly. As I have mentioned in prior articles, many precious metal analysts believe gold and silver are either “Insurance” or “Stores of Value” rather than investments. They believe that the precious metals should be held as insurance against the collapse of currency or governments, while others believe that it will retain a store of value against inflation and etc. While I believe these are valid reasons to own gold and silver, they fail to address the energy issues going forward and their impact on the monetary metals. The Dollar was able to survive for another 3+ decades after gold and silver peaked in 1980, due to a rising global energy supply. A Fiat Monetary System based on fractional reserve and compound interest needs a growing energy supply to survive. Peak Oil should have already come and gone several years ago, however massive amounts of new debt allowed non-commercial oil deposits to be extracted. Even though shale oil production from the Bakken in North Dakota has provided a great deal of oil to the United States, it has come at cost. 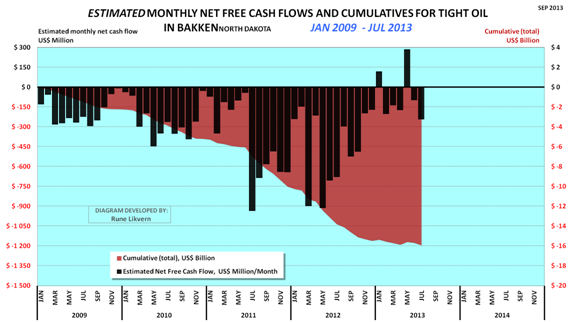 According to Rune Likvern of Fractional Flow, his estimated cumulative net cash flow of the Shale Oil producers in the Bakken is now at a Negative $16 billion. The Red area of the chart shows the estimated cumulative net cash flow and the black bars represent the monthly net cash flow. Thus, the shale oil companies in the Bakken had to acquire an estimated $16 billion of additional funding not providing by their operations alone. Unfortunately, unconventional oil resources such as Shale oil and gas will not be able to allow “Business as Usual” in the world to continue as the costs are greater than what consumers can afford to pay. This is indeed the reason why we have been witnessing the “Great Shale Energy Hype” by the oil industry and official institutions. Without shale oil or gas, the Fiat Monetary System would have more than likely died a few years ago. 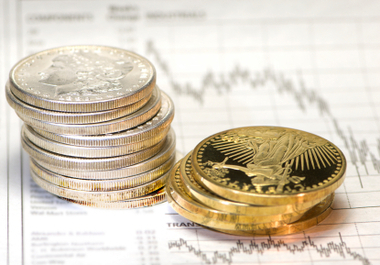 Gold and silver will become excellent investments as they will be the GO TO ASSETS as most others will become increasingly worthless as the global energy supply peaks and declines. Furthermore, it may not be prudent to switch out of the majority of ones gold and silver investments and into other asset classes when the GREAT REVALUATION OCCURS. I will explain why in more detail in the future. However, most Real Estate values on average will decline substantially in a peak energy environment. Real Estate in selected areas and regions will do better than others. Moreover, warehouse and commercial real estate will suffer significantly as the market will deal with decades of overbuilding on top of dwindling demand. Very few realize just how much a peak energy environment will affect the economy and their investments going forward. The SRSrocco Report will provide information and updates on how energy will impact the precious metals, mining and overall economy.